The Parrish Art Museum sits at the East End of Long Island in a landscape fabled for its soft natural light and its pale shimmering beaches. The cast list of artists who claim this landscape is impressive - from Impressionists William Merritt Chase and Childe Hassam in the late 19th century, to Abstract Expressionists Jackson Pollock and Lee Krasner in the 1940s & 50s, to more contemporary artists like Chuck Close and David Salle. The building, opened in 2012, provides a new home for the Parrish Art Museum and clearly evokes the vernacular robustness of the rudimentary agricultural barns and sheds typically adopted by many of the artists residing in the 'East End' : rough finishes, cavernous spaces, deep overhanging roofs and the critical north light. The pleasing heft of the heavily grained wooden entrance doors announces the strong presence of materials that make this art museum an unusually sensual and moving experience. Not unlike the Louisiana Museum of Art in Copenhagen (and the Tadao Ando extension at The Clark in Massachusetts), the relationship between the building and the landscape here is an essential element of the experience. Even on a wintry day, with not a leaf in sight, the punctured gallery walls frame compelling images of the natural environment. Two photographs of Le Corbusier's chapel at Ronchamp show instantly how the photographer adds an important layer to how we understand and connect with the built forms around us. Ezra Stoller (left) shows the full form of Le Corbusier's radical design. Photographed shortly after the building opened in 1954, Stoller's interpretation speaks of the dazzling crispness of European modernism and is reverential in its capture. 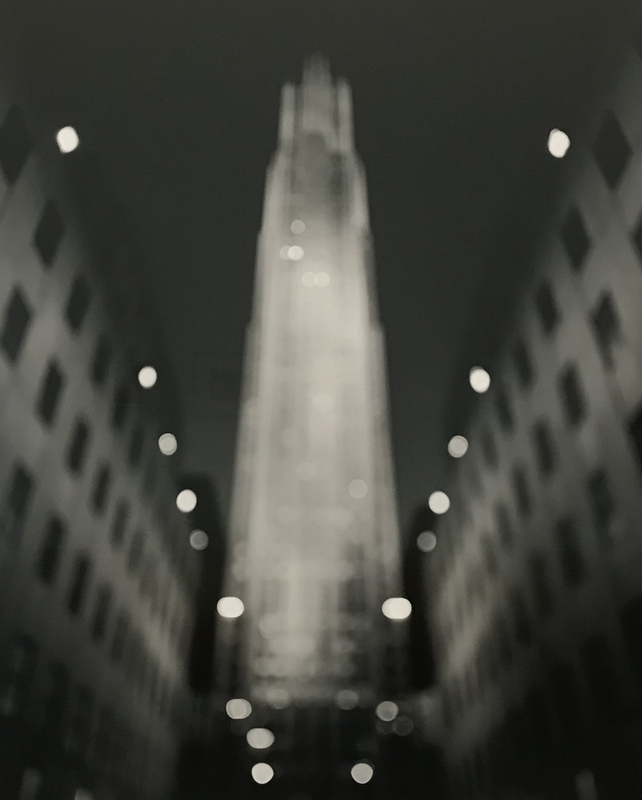 By contrast, Sugimoto's large format image from 1998 presents a partial and slightly blurred image of this architectural icon, we are not sure of its status, its form, its place in the canon. Its hazy, filmic qualities recall a kind of faded glamour. Andreas Gursky...being Gursky. A visual feast that delights from afar and blows your mind close up. Gallery spaces at the Parrish are at once characterful (polished concrete floor reflects and catches light, the timber truss is warm and recalls domestic structures, the roof lights bring soft daylight to the room while keeping out direct sunlight) and yet at the same time very spare. I felt I had all the space in the world to breathe in the images, to contemplate and sit with what emerged between me, the space and the artworks. Pergamon I is a fabulous study of human beings in a museum by Thomas Struth. Is it staged? If not, how long did he sit to capture such a theatrical snapshot of human behaviour? He plays with our relationship to the built form, to history, to power and social norms. The delight of Herzog & De Meuron's structure is sustained throughout. Wood finishes to the shop and the reception areas, along with one of the most successful polished concrete floors I've ever seen, gave me a very pleasing sense of both simplicity and sophistication. A cast concrete bench runs the perimeter of the exterior - an important touch that lends human scale to a huge form and invites activity outside the gallery walls. On a warm sunny day these external spaces are busy with life but, even on our quiet Sunday, they expressed a sense of human habitation and interaction with the solid materials of this assertive building.